Travelling for dental treatment has never been easier or cheaper than it is now. We offer an excellent English-speaking service and high quality dental work with typical savings of between 50% to 80% on UK prices, without the need for lengthy stay-overs. A full ceramic crown can cost £950 in the UK, but at our clinic it costs around £210! Dental implants in the UK can cost around £2,000 but we can save you up to £1,450 by getting the treatment in Vilnius. 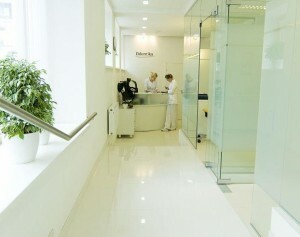 Our partner clinic is the leading dental clinic for patients from abroad in Vilnius. Each year they treat several hundred patients from abroad making them Lithuania’s number one dental tourism clinic and service provider. 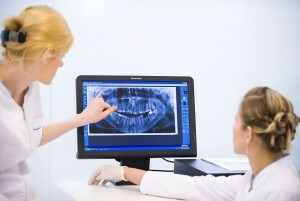 Why choose our dentists for Dental Treatment in Vilnius? Our clinic offers a wide range of procedures for adults and children, with the most extensive guarantee in Eastern Europe. We take pride in delivering the very best dental treatment and service for each and every one of our patients. The specialists endeavor to tailor all services and treatment plans to the individual patients needs. We never stop investing in our clinic to bring you the very best treatment. The clinic is also one of the few in Europe to offer One-visit dentistry. For business people and those with busy lifestyles making frequent visits to the dentist can be time-consuming. Likewise people travelling for dental treatment have in the past had to wait 4-5 days to have crowns or bridges made, adding additional expense. 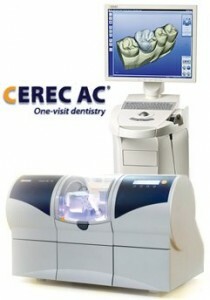 CEREC is revolutionizing the dental industry, enabling porcelain restorations to be completed within a single appointment. With the acquisition of laboratory processing Odontika can now offer same-day crowns, veneers, in-lays and on-lays. Very soon bridges too. What does this mean for you? The powerful CEREC MC XL PREMIUM allows our dentists to digitally scan in the mouth using exclusive Bluecam technology, which provides digital impressions of the highest precision for impeccable results, and mill the required fitting. A standard crown can be produced in less than an hour meaning only one visit is needed, there is less drilling, fewer injections, and with digitally scanning you get the most accurate fitting. Contact us for more information and FREE quotation. ”I cannot speak highly enough of Dr Ieva and her team. After finally realising that I needed some serious treatment with failing teeth, old crowns and potential infections, I decided to look at how to economically solve a growing problem. I wanted a trouble free, new mouth and realising the cost in UK, I looked abroad. Dr Ieva was the first to reply to my enquiries and was immediately understanding and responsive. Even when encountering a minor problem with a UK X-ray and travel arrangements, Dr Ieva’s team responded quickly and efficiently with a solution which gave me confidence that I was in very good, ethical hands. Having decided to have treatment, on arrival in Vilnius I was met at the airport by Alistair Day-Stirrat and made to feel very welcome with clear confirmation about my stay and treatment in Vilnius. I was then taken to meet Dr Ieva and after the initial inspection and (panoramic) X-ray what really impressed me was how honest and practical the recommended course of treatment was. Thereafter, a plan was carried out with so much attention to detail and understanding of my situation that I felt really well looked after. The support team, from technicians to reception, were terrific – so courteous and helpful, and cheerful and welcoming. A lot of work was necessary and it was a comprehensive schedule but I could have chosen a different time scale if I had wanted to. Full consideration was always given to how I felt during my treatment and equally, full explanations were always given about why certain treatments were being carried out to complete the plan. At all times Dr. Ieva was honest, open and what is more, determined and dedicated to achieving what we had discussed and agreed. I now have completely trouble free teeth, no sensitivity anymore, and a smile that looks good but natural and not too much like something on the front of a movie magazine. That said, if I’d wanted a movie star smile, I was told I could have one! ”It was a nice service, good quality, flexible, fast, because I had different treatment. There were aligners, crowns, whitening, fillings, and aesthetic fillings. I am happy about all of them and I will recommend this clinic to everyone. Aligners for teeth straightening – they were easy to use: invisible, easy to clean, quick sensation, no disagreeableness, possibility to take off when it was important for me, and a successful result. I don’t know what more I can say. I’m happy with the result – that’s the most important thing about Clear Aligner treatment.” S. Svarthaugen, patient from Norway. CALL US 0207 617 7301 or email to info@bodybureau.co.uk and get more information how you can save on quality dentistry.